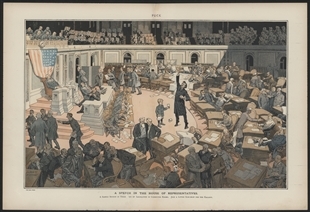 A scene of confusion in the Chamber commented upon the relative importance of committee work and floor debate in the House—the histrionics of the Member speaking on the floor are called a “side show” for the visitor’s gallery. The visitors depicted are mostly white-bearded old men, cupping their ears to hear. Members talk and laugh amongst themselves, napping, reading the news, and doing everything but listening to the proceedings. 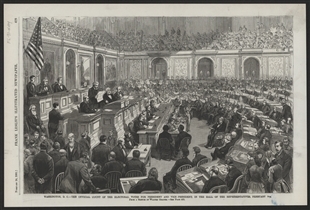 The only attentive individuals on the floor are the official reporters, furiously scribbling, and the forlorn Page, standing with a glass and pitcher next to the expostulating Congressman.